The Sutra in Forty-two Sections Spoken by the Buddha. The ten words of the title express both the general and individual names of this Sutra. All sutras spoken by the Buddha share the general name "sutra." The individual name, which accompanies the word "sutra," is the particular name of that sutra, which distinguishes it from other sutras. The word "sutra" is just like the word "human," which we use to describe all people. "Human" is the general name, and each person has his own individual name: this one is named Smith, and another is named Chang. The sutras the Buddha spoke are also like that; they have both general and individual names. "The Sutra in Forty-two Sections Spoken by the Buddha" is the individual name of this Sutra. Examining the words of the individual name, we find that the title of this Sutra is established on the basis of a person and a dharma. The Buddha is a person and "Forty-two Sections" is a dharma. Therefore, the title is referred to as established on the basis of a person and a dharma. This Sutra is composed of Dharma spoken by the Buddha. When the Buddha disciples were compiling the Sutra Treasury , they selected individual passages and combined them into one work. You could also say it a Buddha-anthology . 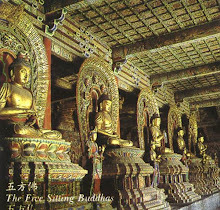 The Buddha's sayings were put together to make one sutra. The forty-two sections are the forty-two selections of the Sutra. This was the first sutra to be transmitted to China. The two Honorable Elders Kashyapa-matanga and Gobharana brought this Sutra to China from India on a white horse (around a.d. 67). White Horse Monastery was established in Loyang by Han Ming Di, the emperor of that time. The Buddhadharma was transmitted to China during the Han Dynasty (206 b.c.d. 220). During that era, Taoism also flourished. When Buddhism came to China, the Taoist masters became jealous. They held an audience with the emperor and told him, "Buddhism is a false faith. It is a barbarian religion; it not Chinese. Therefore, you should not permit it to spread through China. You should abolish Buddhism!" they urged. "If you will not abolish it, then you should at least hold a contest." What were the rules of the contest? The Taoists suggested that the emperor put the Buddha sutras together in a pile with the Taoists' texts and then set fire to them. Whichever books burned belonged to the false religion, and the texts that survived the flames would be recognized as the true ones. The Taoist leader Chu Shanxin and five hundred other Taoist masters put the Taoist texts together with the Buddhist sutras and then prayed to the Venerable Great Master Laozi, "Divine Lord, O Virtuous One of the Way! You must grant us a magical response to ensure that our texts will not burn and that the Buddhist sutras will go up in flames!" As soon as the Taoist texts were set on fire, they burned to ashes and were gone. Those who had been able to soar through the clouds couldn’t do it anymore; they had lost their spiritual powers. Those who had been able to sail to the heavens could no longer manage it. Those who had been able to hide in the earth could no longer hide in the earth. Those who had been able to vanish couldn’t vanish. The spells they mumbled no longer worked. There was no response. The Taoist texts burned to a crisp, and the Taoist masters Chu Shanxin and Fei Zhengqing died of rage right then and there! Witnessing the death of their leaders, two or three hundred Taoists shaved their heads and became Buddhist monks on the spot. So, the first time Taoism and Buddhism held a Dharma-contest, the Taoists lost. 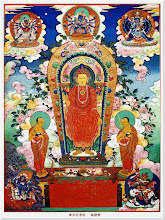 After the book burning , the two Honorable Elders, Kashyapa-matanga and Gobharana, ascended into space and revealed the Eighteen Transformations of an Arhat. They emitted water from the upper part of their bodies and fire from the lower part; then they emitted fire from the upper part of their bodies and water from the lower part; they walked about in space; they lay down and went to sleep in space; and they manifested various spiritual transformations there. 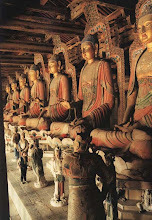 Right away the emperor and all the people simultaneously came to believe in Buddhism. That is why this Sutra is extremely important. It was the first Buddhist sutra to be transmitted to China. So, we have come together to investigate this text today. Let look into the word "Buddha" first. Buddha is a Sanskrit word. The complete transliteration into Chinese is “fo tuo ye”; translated, it means "an enlightened one." There are three kinds of enlightenment: enlightenment of oneself, enlightenment of others, and perfection of enlightenment and practice. 1. Enlightenment of oneself: Someone who enlightens himself is different from an ordinary person who is not enlightened. Cultivators of the Two Vehicles , the Sound-hearers and Pratyekabuddhas , have enlightened themselves and are thus no longer the same as ordinary people, but they do not enlighten others. 2. Enlightenment of others: Someone who can enlighten others is different from the cultivators of the Two Vehicles. This person is called a Bodhisattva. 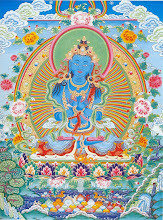 Bodhisattvas can enlighten themselves and enlighten others. Being able to benefit themselves, they can also benefit others. They regard all living beings impartially. 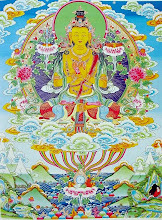 They themselves are enlightened, and they want all living beings to become enlightened also. This is called the enlightenment of others. Spoken by. The Buddha spoke this Sutra because he found joy in his mind delights and wanted to share that joy with others. That means that he expressed the things that made him happy, and by doing so, his happiness increased. Forty-two Sections. There are forty-two sections in this Sutra, and each of these is one of the Buddha discourses on Dharma. Sutra. The word "sutra" has four meanings : to string together, to gather in, constant, and a method. 4. "Method " refers to what people in the three periods of timeast, present, and future similarly venerate. People within the three periods of time revere this method and use it to cultivate. The word "Sutra" contains other meanings, too. A sutra is like a bubbling spring, because principles flow forth from it like water from a spring. It is also like a carpenter plumb line, which is a tool that carpenters use for marking straight lines on boards. The carpenter covers his string with ink and then snaps it so that it marks the board. This analogy symbolizes that sutras serve as the standard of the Dharma. A further meaning of "sutra" is path. Sutras teach people methods for cultivation, so the word "sutra" also means a path for cultivation. There are other meanings as well in the word "sutra." 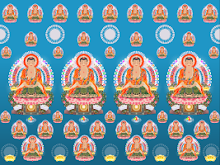 This is a general explanation of the meaning of the Sutra title, The Sutra in Forty-two Sections Spoken by the Buddha. The Han Dynasty was divided into the Western Han (206 b.c..d. 23) and the Eastern Han (a.d. 25 220). The Later Han, the period referred to here, is known as the Eastern Han. In the Eastern Han, during the third year of the Yung ping reign period (a.d. 62), Emperor Ming dreamed that a golden man with a halo of light above his head flew into the imperial palace. The next day he asked his cabinet ministers about the dream, and an astrologer named Fu Yi said to the emperor, have heard that in India there was a holy sage whom people called Buddha. Your dream, Your Majesty, is certainly of the Buddha. " At that time a scholar named Wang Zun also told the emperor, about a book was written in the Zhou Dynasty called Records of Strange Events (Yi Ji). That book states that when the Buddha was born in the Zhou Dynasty during the twenty-sixth year of the reign of King Zhao (around 1024 b.c. ), the creeks and rivers overflowed their banks, the entire earth quaked, and a five-colored auspicious light pierced the heavens. At that time there was an astrologer and diviner named Su You . He consulted the I Ching [Book of Changes] and got the hexagram qian, nine in the fifth place, lying dragon in the heavens. ' Su You ascertained that a great sage had been born in India who would transmit a teaching that would come to China after a thousand years. Later in the Zhou Dynasty, during the reign of King Mu (1001 946 b.c. ), there was a massive earthquake that shook heaven and earth. A white rainbow with twelve rays was seen extending across the sun. Rainbows are mentioned in the Shurangama Sutra. This was a white rainbow which seemed to arch across the sun during the daytime. This rainbow appeared just as the Buddha was about to enter Nirvana. Although India was far from China, the Chinese were aware of what was happening. The Buddha appearance in the world was no chance event. When the Buddha was born in India, all the creeks and rivers overflowed their banks in China. There were floods, and the entire earth quaked. 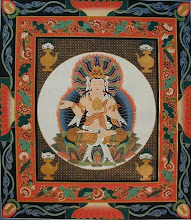 When the Buddha entered Nirvana, a white rainbow with twelve rays arched across the sun. Around this time another astrologer named Hu Duo used the I Ching to consult the hexagrams. He concluded, great sage from the West has left the world. During the Zhou Dynasty, in the twenty-sixth year of the reign of King Zhao (around 1024 b.c. ), this great sage was born in India, and now he has entered Nirvana. " Despite their distance, the Chinese knew about these events that happened in India. In China there were diviners who could predict such events accurately. About a thousand years later, Emperor Ming of the Han Dynasty had the dream about the Buddha (around a.d. 62). 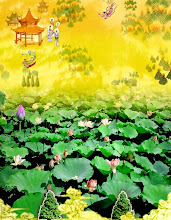 In the seventh year of the Yungping reign, the year of Jia Zi (a.d. 64), he commanded three courtiersai Yin, Qin Jing, and Wang Zuno take eighteen people to India to seek the Buddhadharma. In central India they met the Honorable Elders Kashyapa-matanga and Gobharana . The two returned to China with the three courtiers, arriving at Loyang in a.d. 67, the tenth year of the Yung ping reign period, during the year of Ding Mao. 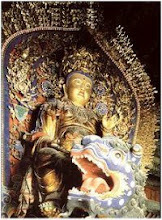 They came on a white horse carrying their sutras, and Emperor Ming of the Han Dynasty built the White Horse Monastery . Four years later, on the first day of the fifth month in the fourteenth year of the Yungping reign period, the Taoists of the Five Mountains in China arrived to stop the spread of Buddhism . As I mentioned earlier, they wanted to set fire to the scriptures of both religions. But unexpectedly, all the Taoist texts burned up, and the Buddhist sutras did not go up in flames. 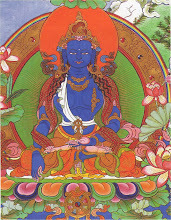 The Buddha sharira radiated a five-colored beam of light. The light seemed to form an umbrella, a canopy in the air, which shaded all those who had gathered to watch the scriptures burn. When all the people in attendance saw this canopy of light, they immediately believed in Buddhism. 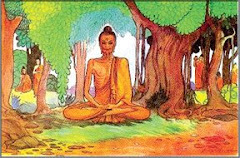 In the Deer Park he turned the Dharma-wheel of the Four Noble Truths and took across Ajnata-kaundinya and the other four disciples, who all realized the fruition of the Way. Then the Bhikshus expressed their doubts and asked the Buddha how to resolve them. The World Honored One taught and exhorted them, until one by one they awakened and gained enlightenment. After that, they each put their palms together, respectfully gave their assent, and followed the Buddha instructions. When the World Honored One had attained the Way orld Honored One " refers to Shakyamuni Buddha and is one of the Ten Titles of the Buddha. 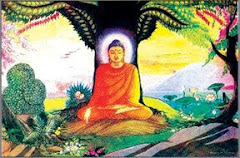 The Buddha saw a bright star at night from where he sat beneath the Bodhi Tree, and he awakened to the Way. He thought, o leave desire behind and to gain calmness and tranquillity is supreme. "He thought to himself, ho is the first person that should be taken across? What shall I do first? " o leave desire behind " means to have no thoughts of desire and to be free of all traces of defilement. almness and tranquillity " means purity, doing action-less action and being thus, thus, and unmoving. This is the finest of all things and is the most inconceivable state. He abided in deep meditative concentration and subdued every demon and externalist. He remained in profound samadhi, finding it supreme. In this state of great concentration, he was able to subdue the many kinds of demons and unbelievers. That why the Buddha traveled to the Deer Park . The park was named Deer Park because in the past there were two deer kings who taught their herds there. I told the story of these deer kings when I lectured on the Shurangama Sutra. If you want to know the details, then you can refer to my commentary on the Shurangama Sutra. At that time Ashvajit, Subhadra, Mahanama-kulika, Ajnata-kaundinya, and Dashabala-kashyapa were all cultivating in the Deer Park. They had been cultivating together with the Buddha earlier, and they were all the Buddha relatives. Ashvajit , Subhadra , and Mahanama-kulika were kin on his father side; and Ajnata-kaundinya and Dashabala-kashyapa were both maternal uncles. The five men had been sent into the wilds by the Buddha father to look after the Buddha. 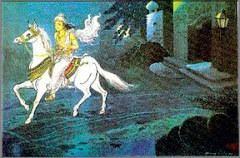 But Ajnata-kaundinya and Dashabala-kashyapa were unable to endure the hardship that cultivation involved, and they left first. 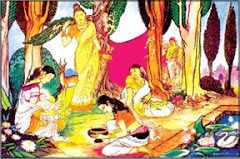 The remaining three Ashvajit, Subhadra, and Mahanama-kulikapon seeing the Buddha accept a bowl of porridge that was sent by a heavenly maiden, assumed that the Buddha could no longer cultivate asceticism. They left him and found their way to the Deer Park. Thus, when the Buddha realized the Way, he first went to find his five fellow cultivators so that he could take them across. 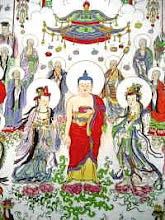 After the Buddha finished speaking the Flower Adornment Sutra , he contemplated all living beings and their potentials and affinities to see whom he should take across first. 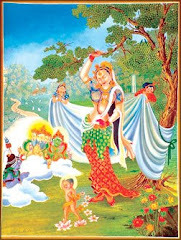 Knowing that Ajnata-kaundinya and the other four were ready to be taken across, he himself traveled to the Deer Park to turn the Dharma-wheel of the Four Noble Truths . "Turn " means to roll the wheel, to make it revolve. The Four Noble Truths are: suffering, accumulation, cessation, and the Way. "Dharma" means "method" and "rule." The term "wheel" is used because the Dharma that the Buddha speaks flows forth from his mind into the minds of living beings, so that they can turn away from confusion and go towards enlightenment. Thus it is called a wheel. "Wheel" also implies crushing and subduing. "Crush" means to break apart. "Subdue" means to make submissive. The more solid the opposition, the more the wheel is able to smash it. It is designed to smash apart the externalists and demon kings. That is the meaning of "wheel." The Dharma of the Four Noble Truths is the first Dharma that the Buddha spoke in our world. It said that the Dharma-wheel of the Four Noble Truths was turned three times . The first time was the Turning of Revelation. 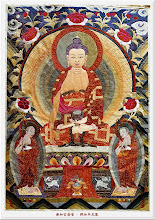 evelation " means the Buddha shows it to us. We don understand, so he tells us about it. Why is it called the turning of the Dharma-wheel of revelation? Because it reveals what the dharmas of the Four Noble Truths are about. The Turning of Revelation is also called the Initial Turning because the Buddha had just begun to turn the Wheel of Dharma. The Buddha said, here is suffering. Its nature is oppressive. " What is oppressive about it? Suffering makes you feel intense misery and deep pain pain so oppressive that it takes your breath away. What kinds of suffering are there? There are: the Three Sufferings, the Eight Sufferings, and the Limitless Sufferings. 3. the suffering of process. What is the "suffering within suffering" ? When one is already suffering , one further undergoes increased misery; when you are already miserable, your pain doubles: that is suffering within suffering. Who would experience this problem? Consider poor people who are starving and cold, people who never eat their fill and who cannot dress warmly. They still have a wooden hut to sleep in at night. Although they don eat their fill and cannot dress warmly, they are still fairly well off. Then suppose that a hurricane or a cloudburst destroys their wooden hut, leaving them homeless. Now, on top of their hunger and cold, they have lost their shelter as well. Wouldn you consider that suffering? Or perhaps someone has a place to live in and enough food to eat, but has no clothes to wear: that is also a form of suffering within suffering. Or someone may have sufficient clothing and shelter, but always goes hungry. That is also the suffering within suffering and is known as the suffering of poverty . Such suffering is hard to endure. It oppresses one to an acute degree. You might object, "Rich people don't experience suffering, right? " Don't you know that rich people experience the suffering of decay? A person may be both noble-born and wealthy, but then be kidnapped by bandits. The bandits estimate his wealth and estate to be worth five million, and they demand six million in ransom. He has to borrow another million to satisfy the kidnappers. Isn't this a case of wealth going to ruin? This is the suffering of decay when it applies to wealth. If you don't experience the suffering of poverty or the suffering of wealth going to ruin, you will still pass through life various processes : from youth to maturity, from maturity to old age, and from old age to death. Your thoughts roll on in ceaseless succession, and that is the suffering of process. Those are called the Three Sufferings. Beyond these forms of suffering, there are also limitless kinds of suffering that we undergo. That is why the Buddha said, "Here is suffering; its nature is oppressive." "Here is accumulation; its nature is to beckon." What accumulates are afflictions. The accumulation of afflictions is a kind of beckoning. Once you have afflictions inside you, afflictions will accumulate from outside. If inwardly you harbor greed, hatred, and stupidity, then outwardly things will not go your way. That is why the Buddha described it as accumulation, with a nature that beckons. "Here is cessation; by nature it can be realized." This is saying that cessation, or still quietude, brings joy. This can be realized. You can realize the joy of this stillness and quietude. "Here is the Way ; by nature it can be cultivated." The Way is a Way of precepts, a Way of concentration, and a Way of wisdom. In detail it refers to the Thirty-seven Limbs of Enlightenment , which are: the Seven Shares of Bodhi, the Noble Eightfold Path, the Five Roots, the Five Powers, the Four Stations of Mindfulness, the Four Right Efforts, and the Four Bases of Psychic Power. Together, they make up the Thirty-seven Limbs of Enlightenment. The Way, by its nature, can be cultivated. The above was the first turning of the Dharma-wheel of the Four Noble Truths, and it is called the Turning of Revelation. The second turning of the Dharma-wheel of the Four Noble Truths was the Turning of Exhortation . The Buddha said, here is suffering, you should recognize it. There is accumulation, you should cut it off. There is cessation, you should realize it. There is the Way, you should cultivate it. " This is the Turning of Exhortation. He urged other people to cultivate the Four Noble Truths. This is called the Turning of Exhortation. 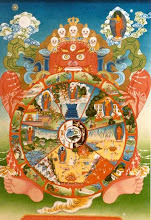 The third turning of the Dharma-wheel of the Four Noble Truths is known as the Turning of Certification . The Buddha said, ot only am I telling all of you to recog nize suffering, cut off accumulation, long for cessation, and cultivate the Way, I am also telling you, here is suffering; I have already recognized it. There is accumulation; I have already cut it off. ' What accumulates are afflictions and I have already cut them off. I would not tell you to stop afflictions before I myself had stopped them. I feel at ease now because I am free of afflictions. That is why I am telling you now to cut off afflictions, and to recognize the suffering that they bring on. here is cessation, I have already realized it. ' I have already realized the bliss of still tranquillity. So I am telling you all now to realize the joy of cessation, too. here is the Way, I have already cultivated it. ' I have completed my cultivation of the Way, and I don need to cultivate it further. Now I hope that all of you will recognize suffering, cut off its accumulation, long for cessation, and cultivate the Way. " 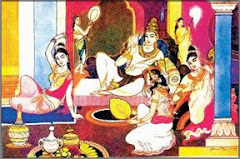 Why did Ajnata-kaundinya awaken first? Because in the past, when the Buddha was at the stage of causation, he was incarnated as the Patient Immortal . King Kali sliced off all four of his limbs and demanded to know whether the Immortal felt any hatred towards him. He replied, o, I don hate you. " King Kali asked, hat proof is there that you feel no hatred? " The Patient Immortal said, f I do hate you, then my four limbs will not grow back as they were before. If I bear you no ill will, then the four limbs that you have severed will grow back just as they were. " With those words, his four limbs did grow back as they had been. After that, the Patient Immortal made a vow: hen I become a Buddha, I will take you across first, because you are my Good and Wise Advisor. " In that previous lifetime, Ajnata-kaundinya was King Kali, and the Patient Immortal was Shakyamuni Buddha. So when the Buddha accomplished Buddha hood, he looked around to see whom he should take across first. hom should I take across first? I should first rescue the man who cut off my hands and feet. " Hence, when the Buddha spoke Dharma for him, Ajnata-kaundinya immediately became enlightened. 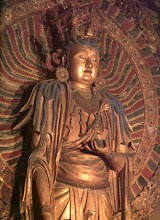 Next the Buddha explained about holding precepts and giving. How does one uphold the precepts? How does one practice giving? How does one get reborn in the heavens? He warned about desire, saying, aving thoughts of desire is wrong; it is impure. If you leave desires behind, only then can you become pure, only then can you gain true happiness. " At that time Ashvajit (Horse Victory) Bhikshu and Subhadra (Little Worthy) also became enlightened. They were the next two to awaken. 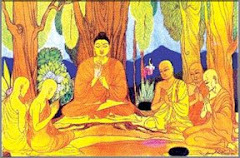 Third, the Buddha went on to explain other Dharma-doors, and at that time Mahanama-kulika and Dashabala-kashyapa also became enlightened. Those five men were the first to leave home and become Bhikshus. They were the first ones to become enlightened and to realize the Fourth Stage of Arhatship. So the text says, " and took across Ajnata-kaundinya and the other four disciples, who all realized the fruition of the Way. " Then the Bhikshus expressed their doubts. Later, the other Bhikshus asked the Buddha about the Dharma to clear up their misunderstandings and doubts about principles. nd asked the Buddha how to resolve them. They asked the Buddha whether they should go forward in their cultivation or stop where they were. They asked the Buddha to make a decision for them. The World Honored One taught and exhorted them until one by one they awakened and gained enlightenment. The Buddha taught and transformed the Bhikshus, and gave them instructions; he offered them advice. After the Buddha taught and transformed them, every one of the Bhikshus became enlightened. That is when they each put their palms together, respectfully gave their assent, and followed the Buddha esteemed instructions. Then they placed their palms together respectfully and gave their assent. That is, they put into practice the principles that the Buddha taught them. Because I thought everyone already understood, I skipped explaining the meaning of "bhikshu." I didn't realize that some people still don't understand. 3. Frightener of Mara: When a Bhikshu ascends the mandala platform to receive the Bhikshu precepts , the Precept Teacher (Upadhyaya) asks him, re you a great hero? " The candidate answers, es, I am a great hero! " At that reply, the demons of the heavens and the externalists tremble with fear. Therefore he called a frightener of Mara. When one leaves home to become a novice (Shramanera), one must know the meanings of the words Shramanera and Bhikshu. After he leaves home, a Bhikshu must know how to destroy evil and how to cut off afflictions. Destroying evil is the equivalent of cutting off afflictions. Our afflictions are extremely evil. If you wish to know whether or not an individual cultivates the Way, you need only check to see whether or not he still has a temper. A person with a big temper does not cultivate the Way. Someone who cultivates the Way is able to patiently endure anything that comes along. No matter who scolds or beats him, he can endure it, to the point that even if someone were to kill him, he could endure it. In all of these situations, one must be patient. Besides being patient, one must possess wisdom and a discriminating eye. That is why a Bhikshu has a world-transcending appearance. If a Bhikshu is able to cut off delusions and to realize the Truth, if he can cut off the delusions of the Triple Realm, then he will realize Arhatship. We have with us someone who studied Buddhism for four or five years in the past, but only now, after years of searching, has he been able to find his way to Gold Mountain Monastery. This hasn been an easy accom plishment. In the world there are many people who look high and low to study the Buddhadharma, but who can find a genuine place to study. You who have made it to Gold Mountain Monastery should not assume that it has been an easy matter getting here. It difficult to enter Gold Mountain door. I hope you will all take special note of this point.